During my short staycation at Loews Don CeSar this week, my husband and I got a sneak peek of the Double Don Burger, part of Loews National Burger Month. Loews Resorts National Burger Month kicks off today, May 1 and will last through the end of June. We spoke to Executive Chef Kenny Hunsberger about this promotion, who wanted to highlight local flavors of the burger without making it too fancy. The Double Don Burger and a Brew combo was a home-run. Loews Don CeSar sources pasture raised ground beef from Johnston's Farm in Bradenton. 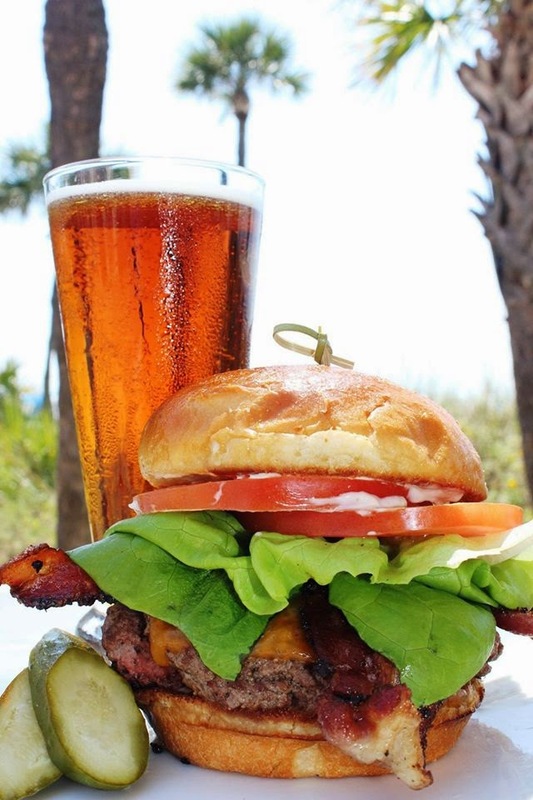 Two burger patties are topped with slices of Nueske's bacon, vine ripe tomatoes, bib lettuce, cheddar cheese, garlic aioli and Cigar City Brewing Madura Mustard. The amazing Double Don is paired with your choice of Cigar City Brewing Madura Brown Ale or Cigar City Brewing Hotter Than Helles and is available for only $20 for a limited time ($16 without the beer). I loved it so much that I am sharing the Double Don Burger recipe with you! Combine the garlic, egg, lemon juice, parsley, salt and pepper in a blender and puree. Add oil in a slow stream and continue to process until the mixture has formed a thick emulsion. Combine brown sugar, Maduro Beer, cayenne and Dijon mustard in a pot and reduce on medium low heat for 10-15 minutes. Stir constantly to insure the mustard does not burn. Cool down before use. Loews Don CeSar Hotel is located at 3400 Gulf Boulevard, St. Pete Beach, FL 33706 or visit www.loewshotels.com for more information.